Be respectful of the game, yourself and others while out on the golf course. Playing golf is a great way to get outside, enjoy the sunshine and spend time with friends and family. It's also a great way to challenge yourself and test your skills. But it's important to remember you are sharing the golf course with everyone else, and there are rules to remember and etiquette to be followed. 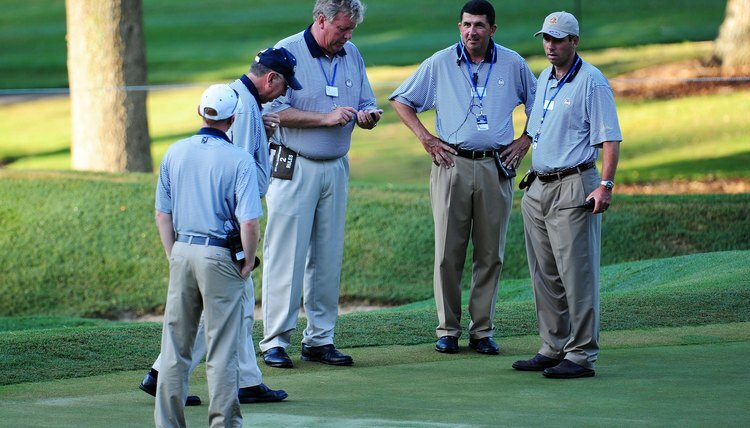 Most golf courses do not allow more than four golfers in a group. Larger groups take far too long to finish each hole, and it's unfair to those playing behind. Most courses also require that each player has a set of clubs. You can usually rent them if you don't own any. When you take a divot in the fairway, replace it. Some courses ask that you fill the divot in with sand (provided on the carts) instead. When you walk through and play out of bunkers, rake the sand afterward to be fair to those playing behind you. If your ball makes an indentation when it hits the green, fix it with a ball mark tool or tee. Play quickly. It's OK to concentrate and not completely rush yourself, but be considerate to other people. It's no fun waiting for an extended period on each hole because the group ahead is slow. If your group is slow, let faster groups play through. Almost every course stresses the importance of playing "ready golf"--be prepared to play as soon as it's your turn. Do not damage the golf course with carts. Don't drive on or around the greens or tees. Stay within the boundaries established by the golf course and don't drive on private property. Do not hit your ball until the group ahead is far out of reach, or hit onto the green until the players in front of you are well clear. Make sure your immediate surroundings are clear before swinging the club. Respect the game and other golfers. Don't swear or throw your clubs. Be quiet when you are near another golfer who is about to play. When on the green, do not walk on the line directly between the hole and another player's ball. Footprints can disrupt the roll of the ball during a putt. Do not stand directly in the line of sight of another player when he's putting.